Yesterday I learned something surprising about running in Malaysia – according to Karen Loh, Race Director, for the Malaysia Women Marathon, only 12% of marathon runners in this country are women*. The numbers are around 23% and 45% for the 21km and 10 km distances respectively. These figures go a long way in explaining why a women-only event such as the Malaysia Women Marathon (MWM) is needed to inspire and encourage women to take up this life-affirming activity. As someone who didn’t take up running until the wrong side of 40, and then only did so with encouragement (cajoling more like) from my sisters, I can attest to the power of community in promoting this very individual activity. 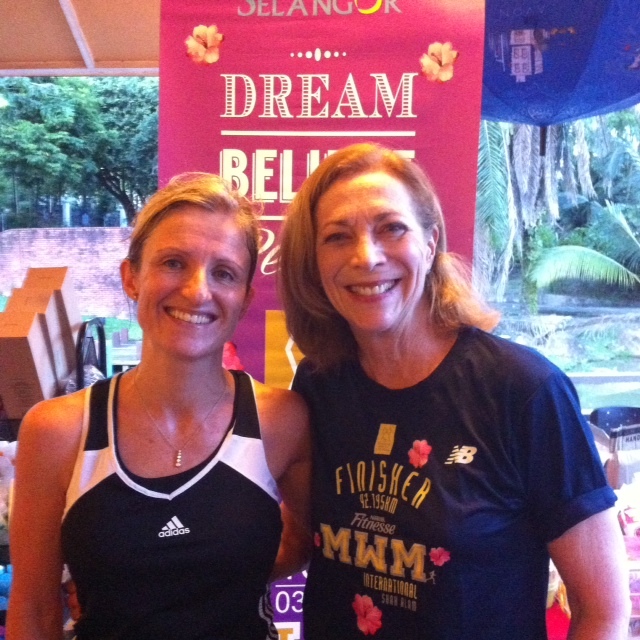 Yesterday, not only did I get to meet new people in the Malaysian running community, but I also met Kathrine Switzer, at the first MWM 2014 running clinic. Ms Switzer is a legend amongst women runners as not only was she the first woman to register for and run the Boston Marathon in 1967, amid much resistance, not least from the Race Director, but she was also instrumental in promoting women’s marathon running to the point of getting it included in the Olympics for the first time in Los Angeles, 1984. ‘It’s strange that just putting one foot in front of the other will give you that but it will’. I loved this comment as it really does acknowledge that we runners are aware that our obsession with something as simple as moving our feet might seem OTT (to non-runners) , but the empowerment of that repetitive act is potent. Kathrine described running as ‘a universal language’ just like music that will make you friends wherever you go. She then spoke about her Boston Marathon experience, which transformed the trajectory of her life, as well as her years working with the Avon corporation to promote women’s races worldwide and put long-distance running on the map as a sport worthy of both genders. Kathrine Switzer’s life mission is to encourage and inspire, which she does by traveling the world speaking and writing, and organising and supporting events such as the MWM. ‘Talent is everywhere, it only requires an opportuntity’ was one of the many nuggets of wisdom Katherine shared during her speech before attendees were given the opportunity to do a short run around the public gardens. We were paced by the MWM mentors who will be providing running clinics in the months leading up to March 16, 2014. After the run, Ms Switzer very graciously did a photo opp and autograph session with sweaty runners before a short question and answer session. She joked that we could ask anything except seek advice on injuries. The first question was one I wanted to ask myself, given my recent issues – in all her decades running, had Ms Switzer been injured? Only three times in over 50 years was the answer, something she credited to having the good sense to stop running as soon as something started to hurt. Taking a few days off at such times was the the best advice. Cross-training was another point of interest. Ms Switzer said that she does yoga, pilates, and weight work at home with hand weights, as well as a lot of planks and sit-ups to strengthen the core. A very impressive demo of a squat against the wall followed – it’s essential for strengthening the quadriceps, and thus protecting the knees apparently. I’ve done it twice already though couldn’t manage it for anything near as long as the Pro (who was running marathons several years before I was born)! Something else Kathrine Switzer said really resonated with me. When the Boston Marathon Race Director tried to physically remove her from the race back in 1967, she got angry. Of course she did! But she couldn’t remain angry for the next 20 miles. It’s simply not possible to run and be angry. The magic of putting one foot in front of the other is not merely the positive impact it has on the body, but the transformative effect it has on the mind. 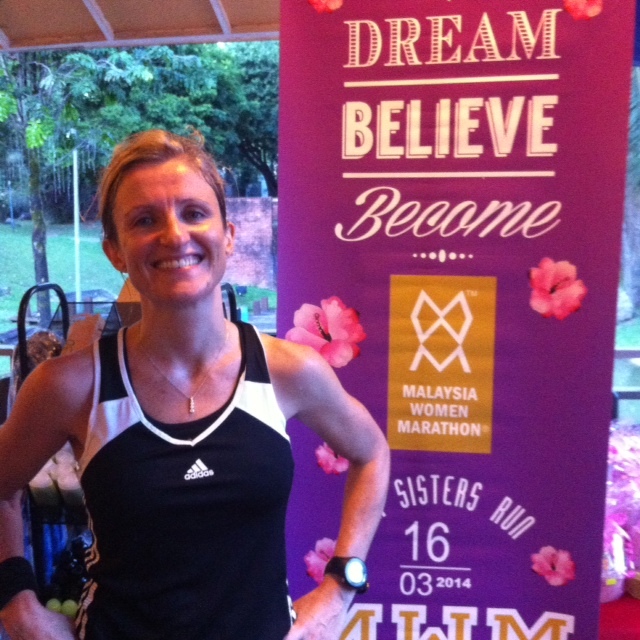 Hopefully, events like the MWM will encourage more women in Malaysia to discover the magic of running. Come on ladies – 12%? You don’t know what you’re missing! Want to know more about the Malaysia Women Marathon 2014? Click here. * around 12% of Full Marathon registrants for the Standard Chartered Kuala Lumpur are women.